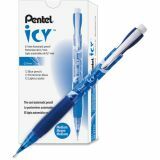 Pentel Icy Mechanical Pencil, .7mm, Trans Blue, Dozen - Icy Mechanical Pencil is an economical, multipurpose pencil with a smooth barrel and Comfort Zone grip for nonstop writing comfort and control. 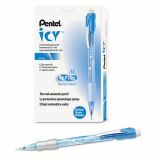 Extra-comfortable, extra-soft ribbed grip is made of latex-free rubber for less writing fatigue. 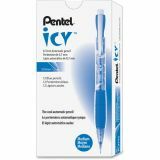 Pencil is preloaded with Pentel Super Hi-Polymer HB lead. Super-strong lead never needs sharpening and produces a dark line. Transparent barrel allows you to monitor lead supply. Automatic pencil also offers a large eraser, convenient metal pocket clip, top click, stationary tip and fixed sleeve. 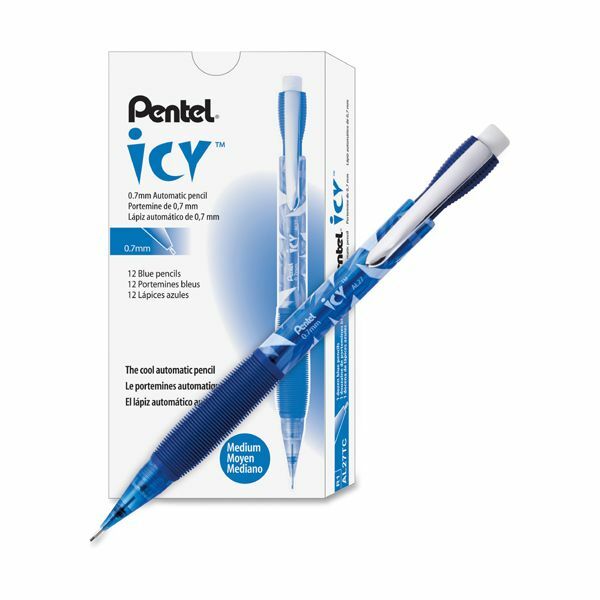 Refill with Pentel's Super Hi-Polymer Lead and PDE-1 large refill eraser.